Ryota was born on Aug 1,2014 in Japan. He only weighed 2.45kg (5.4lbs) at birth but I felt he was strong from his loud crying. At 4 months old, his abnormality was discovered when we went to the clinic because he was not taking milk and had a severe cough and runny nose. The doctor said he looked a bit anemic, so he advised us to have him checked at the General Hospital. After going to the general hospital and doing his blood test, they said they were unable to diagnose him. His hemoglobin count was low and he was not at a specialized hospital. An emergency blood transfusion was necessary and was taken to St. Luke's International Hospital by ambulance. St. Luke’s International Hospital sent his specimens to several research institutions and he was finally diagnosed with Pearson’s syndrome. 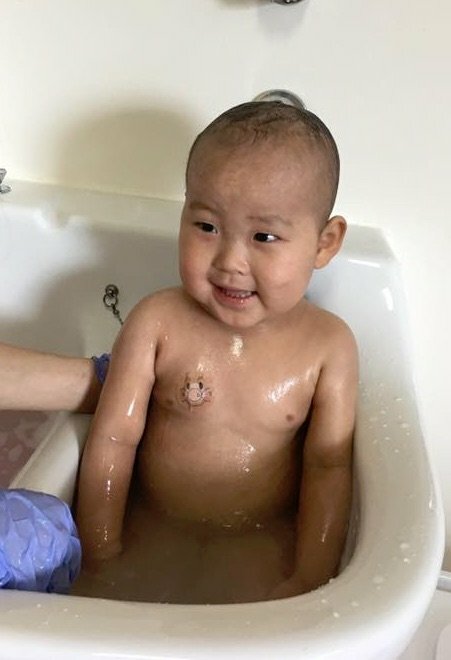 In the past two years, he was able to attend nursery school, however, he got acidosis, and blood cell phagocytosis was found. As a result, he lost a lot of weight and became very thin, however, he still managed to live happily anyway! Recently, we got the results of Ryota's bone marrow examination from the doctor. While he looks very energetic, we were told that his bone marrow could no longer produce blood cells. We have not found any other cases of Pearson’s Syndrome in Japan. Nevertheless, learning that we are not alone and that there are others around the world who live with the same disease gives us strength. Just knowing that we are all fighting together and can find strength in each other is a comfort that we truly appreciate.